During the past year, journalists from major international media have visited the Faculty of Dentistry in Oslo for a very specific purpose: they wanted to know about a mysterious death in 1970. They all asked the same questions: Who was the woman found in the Ice Valley? Why and how did she die? Sigrid I. Kvaal has had a lot of practice in talking to journalists during the last year. In April she was visited by a team from the BBC, and after a long talk in her office, they prepared for a video interview in one of the clinics at the Faculty. Photo: Ingar Storfjell, OD/UiO. A Tuesday afternoon in April, when students and staff have gone for the day: The buildings are deserted, waiting for another day, except in one place. In the office of Associate Professor Sigrid I. Kvaal there is plenty of activity and excitement. 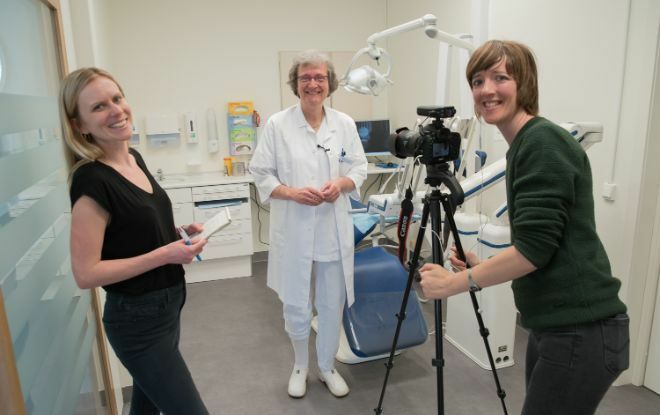 – I can say that this dental work was not done in Norway, explains Sigrid in perfect English to two young journalists, bubbling with excitement as they put their questions. She points to some older pictures of a set of teeth with a number of gold bridges. One of the journalists asks whether the work could have been done in the UK. – No, not in England either. Most likely it was done somewhere in Eastern Europe, the Associate Professor says. The set of teeth belonged to the woman from the Ice Valley (Isdalen), who is becoming quite well known. The visitors in Ingrid’s office are from the British national broadcaster, the BBC. The two journalists, who were not even born when the mysterious owner of the teeth drew her last breath, have travelled to Norway to record a video interview with Sigrid, among other things, even though colleagues from the BBC had already interviewed her for the radio earlier in the year. Both the German magazine Die Zeit and the Norwegian TV channel NRK paid her a visit the past year. What is this special knowledge that brings journalists almost flocking to the Faculty of Dentistry in Oslo? 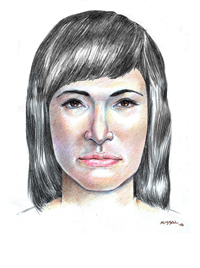 A police drawing showing what the woman from the Ice Valley looked like, based on witness statements and descriptions. Drawing: Stephen Missal. We have to go back some decades in time. Most people who have grown up in Norway and were old enough to watch the TV news in 1970 can remember the mystery of the Ice Valley woman. A charred body was found in the valley Isdalen (Ice valley) near Bergen in November that year. The police were uncertain whether it was a case of murder or a suicide but decided just before Christmas that it was a suicide. Nevertheless, many of the circumstances surrounding the woman give rise to questions about the police conclusion, about why she was in Norway and what she was doing in western Norway. After the body was found investigations revealed some striking details indicating that the woman had travelled extensively under a number of different names, using different passports. She had unusual habits and unusual things in her luggage. Since the police never established the woman’s real identity, the police – motivated by journalists – have now turned to researchers and scientific methods for help with the case and other details such as how old the woman was. Recent investigations of the remains of the body has revealed more than the woman’s age, disclosed in BBCs podkast «Death in Ice Valley». – Many surprising details came to light almost immediately after the dead woman was discovered. Her suitcases were found, revealing the many different identities she had used. Police discovered that she was not Norwegian, and could estimate an approximate age. So they found out a lot about her in 1970, knowledge we can continue to build on today, says Sigrid. Most of the reasonable theories about who the woman was and what she was doing in Norway were examined when NRK ‘re-opened’ the case in 2016, and equally thoroughly reviewed in the BBC podcast made this year, in English, and targeting an international audience. The ten episodes were released together with a dedicated forum for discussion on Facebook, with a group that now has about 16,000 members. The group is highly active: every day participants from all around the world initiate new discussions and speculations. The German media have also shown strong interest in the case. The weekly magazine Die Zeit published a long article in its 11th January issue, with a follow-up some months later.The TV-channel Südwestrundfunk (SWR) has made their own programmes about the mystery. In the quest to find the woman's identity, Sigrid, with her special expertise and experience as a forensic dentist, has been a popular subject for interviews. The concept of forensic dentistry is to use dentistry in the service of the law and of justice, to identify individuals by comparing sets of teeth with records kept by dentists, examining traces of bites or damage to teeth in cases of violence, and in assessing age. The Associate Professor has especially been associated with assessing age, since she led the task of determining the ages of unaccompanied minors seeking asylum, an assignment carried out by the Faculty of Dentistry for the Norwegian Directorate of Immigration (UDI). She also carries out about twenty other assignments per year with the National Criminal Investigation Service identification group. Among the most demanding cases she has worked on were identifying victims of the tsunami in Thailand in 2004, and after the terror in Oslo and on the island of Utøya on 22 July 2011. – I don’t think it can ever be pure routine, Sigrid elaborates thoughtfully, and admits that she reacts stronger to some cases than others, for instance when ill treatment or murder are involved. Nevertheless, she believes that working with dead people is something one can get used to. – It was not pleasant the first time I saw a body in the anatomy lab. We had to dissect it, and it did not help that the body was in a poor state of preservation, she says, with a wry chuckle. – But when the first victim I had to identify had died in a fire, I immediately understood why we have to use scientific methods to identify victims . Today, Interpol accepts three methods of identifying unknown persons: fingerprints, DNA or their teeth. All three require a reference for comparison: record of fingerprints in identity papers or police archives, common DNA markers with tissue from the deceased or a close relative, or details from dental records. Normally, the first thing the police do is to search for these types of reference points in registers of missing persons. In 1970, DNA was not known as a possible means of identification, but neither of the other two methods led to any results in the investigation of the Ice Valley woman, either in Norway or internationally. Since the case has been reopened with new efforts to identify the woman, the producers of the podcast have contacted various experts who can use different scientific methods and approach the mystery from new angles. Sigrid uses a method she and her team have developed in Oslo. Based on x-rays of the dead woman’s teeth, she measures the size of the pulp or nerve channels. She then applies a formula, and the result gives an indication of age. Sigrid emphasises that the Ice Valley woman’s teeth already have been examined very thoroughly at the original autopsy. The forensic dentist who assessed the woman’s age at that time, Professor Gisle Bang from the Gades Institute in Bergen, used a method he had introduced in 1970 on the actual teeth. As we age, the length of a translucent area on the root of the teeth increases. This is referred to as a morphological change in the teeth. Gisle Bang did not use X-ray radiography as Sigrid did. In his report, Professor Bang suggested that the woman was in her mid 30s. This estimate is somewhat higher than Sigrid’s conclusion; that the woman was in her late twenties. She examined three of the dead woman’s teeth. She considered that one of them indicated an age around 40, while the other two indicated an age of about 25. “Identification is always an overall assessment,” she explains. “You need to take all the available information into account.” Sigrid’s estimate was somewhat older than the age concluded with by the pathologists who originally examined the body: they estimated it to be around 25. The woman from Ice Valley had several gold crowns and bridges in her teeth, which were not typical of Norwegian dental work. Photo: Kripos. Nearly fifty years later, however, modern methods are casting new light over the investigations. The producers of the podcast took the Ice Valley woman’s teeth, which had been securely stored since 1970, to a laboratory in Sweden, where they were examined by a chemical method. Among other things, this method looks for traces in the teeth from atomic explosions and which kinds of food have been consumed, in order to determine their age. These results pointed the search for the woman’s identity in an interesting new direction, and revived the hope of identifying her. – Her teeth especially have given us a surprising number of new answers and quite unexpected clues to follow, says Marit Higraff, one of the journalists. Besides playing a central role in NRK’s coverage of the case, she has also collaborated with the BBC on the popular English podcast. – It is really fascinating how modern technology and scientific methods are able to reveal new details, for instance in biological material from an old case like this. I have really learnt a lot from working with this project and the collaboration with scientists and experts in different fields from around the world. The audience reports the same feedback – many of them are very enthusiastic about what they have learnt about science through our podcasts series. The NRK journalist, Marit Higraff, who also appears in the BBC podcast, was surprised at how much has been revealed about the woman retrospectively through examinations of her teeth and other scientific methods. Photo: Sigrid Winther. The enormous and ongoing interest in the mystery is evident in the Death in Ice Valley Facebook group, which is still active among ‘ordinary’ people in Norway and other countries. Even though the mystery is not entirely solved yet, as the podcast progresses, it seems as if a solution is more likely – and several exciting stories are woven together. Sigrid agrees. – The programme includes all the dead ends in the search for the woman's identity, and that makes it even more exciting. Dental students are taught forensic dentistry in their final year, but it is not an independent specialist field. Those who want to take up forensic studies in their working lives have to pay careful attention and join in relevant projects, in addition to taking an interest in the Norwegian Society of Forensic Odontology, advises Sigrid. Both the international sister organisation, IOFOS, and the Norwegian Armed Forces Joint Medical Services arrange popular courses. These include visits to the forensics department, and participants are allowed to watch a post-mortem. The master thesis is also an excellent opportunity to choose ways to focus on forensic dentistry. This year, for example, the Associate Professor has supervised two students whose master thesis project showed that it is not possible to measure the pulp size of 1st and 2nd molars to assess if a person has reached adulthood. Relevant research can also be extended to doctoral theses. Sigrid is currently supervising a Ph.D.-student investigating the possibilities of using MRI instead of x-ray pictures for age assessments. – Those who want to become forensic dentists simply have to be interested in it and find it exciting. And even though it is absolutely a matter of getting used to it, they must in any case be able to tolerate looking at a dead body, she advises. – It may be a help to remind oneself that death is part of life, after all! Following on from her appearance on the BBC programme, Kvaal has received a lot of questions, both directly and through the Facebook group. She answers as best she can when the questions are within her field. But she is still left with the same questions as all the other listeners when the sound track fades out after episode ten: Who was the woman? Why was she in Norway? And what happened to her?